Minecraft gives the player mind bending levels of creativity and I bring you my version of creativity, nothing like a redstone computer or the epic creations on many servers in the Minecraft world but hopefully something you will like. 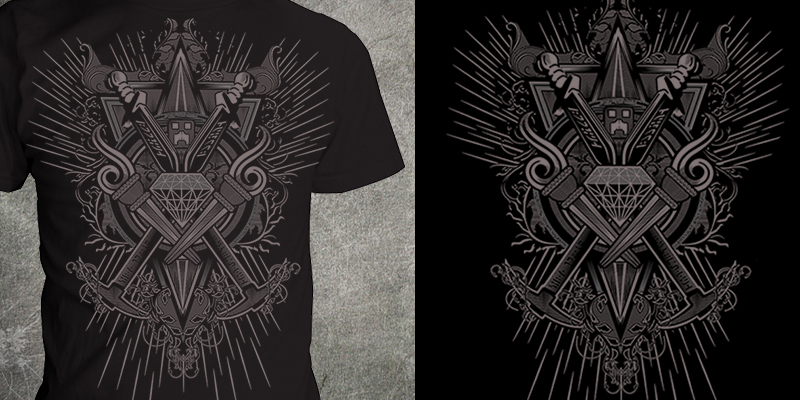 Crest style line work with etched detail and three colours maximum shown. Fans of Minecraft have lots of subtle in-game references (enchanted swords, pickaxes, torches, a diamond and creeper faces). For those die hard fans of Minecraft the Standard Galatic Alphabet is on the design so good luck in deciphering them all. Let me know what the sword is enchanted with and slightly harder; both pickaxes. There are two other creeper faces hidden in the design as well as the obvious one. Get lost in this eye catching print and keep crafting and creating.